If you accept that the main purpose of Audi's A5 coupe is to provide a welcome alternative to coupe versions of BMW's 4 Series and Mercedes' C-Class, then the importance of the affordable 190PS 2.0 TFSI variant we're looking at here can hardly be stressed highly enough. Previously, to get 150mph performance from an A5, you had to stretch to one of the pricey 'S5' variants. Now, not much more than £30,000 gets you behind the wheel of a surprisingly quick version of this car. 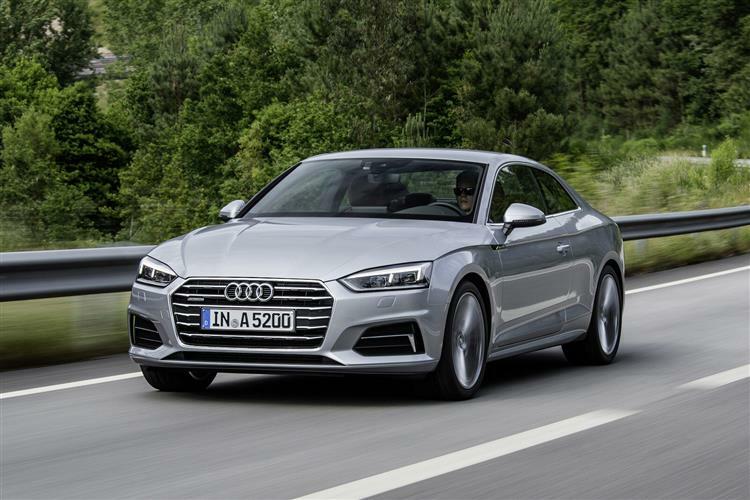 If you fancy a version of the second generation Audi A5 coupe with vibrant performance but need to keep costs in check, the 2.0 TFSI 190PS petrol model could be the one to choose. Jonathan Crouch checks it out. 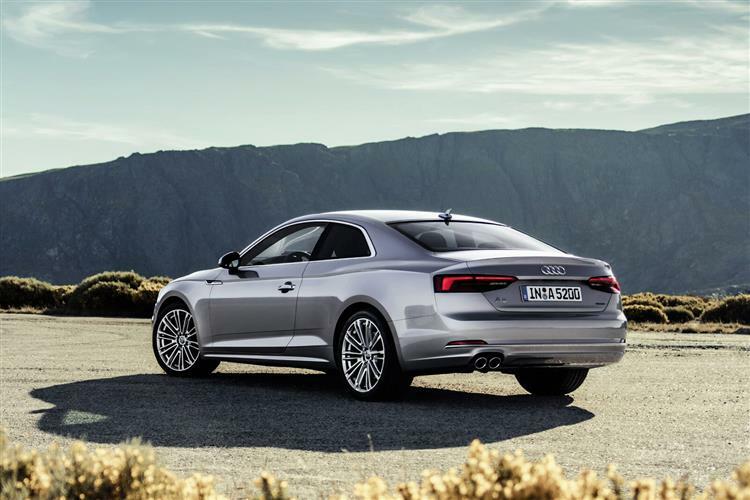 Audi's A5 Coupe has been a strong seller or the Ingolstadt brand for some time now but the entry-level version, a 170PS 1.8 TFSI model, always tended to be the one that buyers tried to avoid. Now, the baseline green pump variant could actually be the one to go for, thanks to the replacement of 1.8-litre power with a freshly-developed 190PS 2.0 TFSI engine offering quite a turn of speed. It's just one of the changes made to this much improved second generation model. Let's check it out. Essentially, what the engineers have done with the new-generation 2.0-litre TFSI powerplant is to further maximise compression efficiency, add in a bit of power and - when it works with the S tronic auto transmission - take full advantage of the lower first gear ratio that the installation of a 7-speed 'box allowed them to fit. The result is sparkling performance. 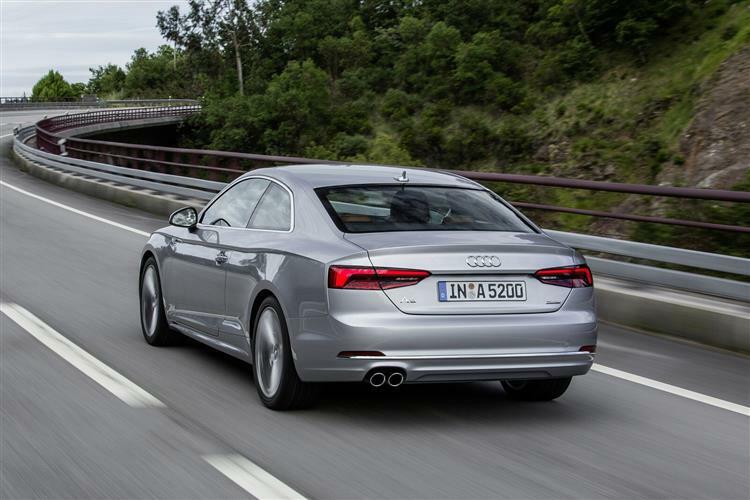 With 'S tronic' transmission fitted, an A5 Coupe 2.0 TFSI is capable of 62mph in just 7.3s, en route to 149mph. As for driving dynamics, well you'd think in this regard that this A5 Coupe would be starting out with a disadvantage over 4 Series Coupe rival. Its front-driven layout will, after all, never reward an enthusiast in quite the same way as a rear-driven BMW. But in originally developing this car, Audi was convinced that it could be made to feel almost as good. To prove the point, three different suspension systems are being offered this time round, two of them passive and one featuring adaptive damping. Whatever your choice, you'll find the set-up firmer than it would be in an equivalent A4 saloon. Think this second generation A5 coupe doesn't look much different to its predecessor? Look again. Yes, features like the previous model's wave-shaped shoulder line are carried over but the whole effect is now sharper and more modern, featuring a sculpted Singleframe grille that's significantly flatter and wider than in the previous model. There's a long bonnet, short overhangs and, most significantly, a stretched wheelbase that creates more room inside. You'll feel that in the cabin - especially if you happen to be seating at the rear. Up front, high-quality materials in a wide range of colours provide for a particularly pleasant ambiance and underscore the premium character of the mid-sized model. Like all the latest Audis, this one gets the brand's 'Virtual cockpit' instrument binnacle, a 12.3-inch TFT display that replaces the conventional dials. Out back, the boot's bigger than before, offering a volume of 465-litres, 10-litres more than with the previous model and more than you get in BMW and Mercedes rivals. The rear seat has a 40:20:40 split and can be easily folded forward using levers in the luggage compartment. Audi also offers an optional gesture control system for opening the luggage compartment lid via a foot motion. 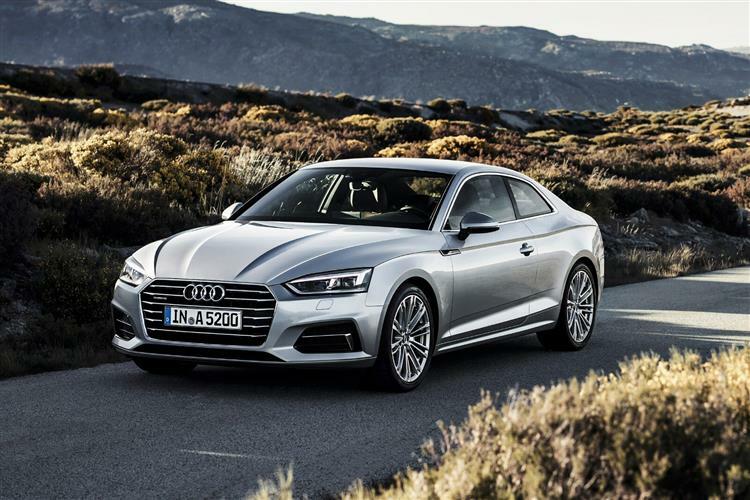 Prices start at around £30,000 and whichever trim level you decide upon for your A5 Coupe 2.0 TFSI, you should find your car to be decently equipped. There are three trim levels - 'SE', 'Sport' and 'S line'. Personally, we'd avoid S line trim with its sharpened suspension that spoils the supple ride that's one of this car's nicest features. Still, that's up to you. If you want S tronic automatic transmission, there'll be a premium of around £1,500 more to find for it. Go for the auto and you'll be offered the further option of finding £1,500 more to get quattro 4WD. Whichever variant you choose, you should find your car to be decently equipped. Among the features included are xenon headlights with LED daytime running lights and LED rear lights, LED interior lights, the Audi 'MMI radio plus' with a 7-inch MMI colour display, Bluetooth, a USB charging function, a three-spoke multifunction steering wheel, the Audi drive select dynamic handling system and Audi 'pre sense city' autonomous braking. Audi is particularly proud of its media connectivity, specifically the 'connect' system that can link to the Internet via the ultrafast LTE network.With the standard Audi smartphone interface, Apple Car Play and Android Auto bring the familiar smartphone environment to the car, if desired. The optional Audiphonebox with wireless charging in the centre armrest uses near-field coupling to link smartphones wirelessly to the vehicle's antenna. The A5's size, its optional 4x4 transmission and its equipment-laden interior might lead you to fear for its fuel economy but there really is no need. The standard 190PS 2.0 TFSI car can return a creditable 50.4mpg. Emissions are 127g/km. Go for the S tronic auto gearbox and you're looking at 55.4mpg and 139g/km. While an auto model with quattro 4WD returns 38.7mpg and 167g/km. This has been achieved thanks to a whole raft of high-efficiency engineering techniques, including across the range a more efficient electromechanical power steering set-up, an energy recuperation system and Start / Stop technology that cuts the engine when you don't need it, say when you're waiting at the lights or stuck in urban traffic. Use the 'Audi drive select' set-up and there's the option of an 'efficiency' mode that'll focus all of the car's systems on driving eco-consciously. For most buyers, most of the time, the 190PS 2.0 TFSI A5 Coupe will be all the car they actually need. Audi will go on selling plenty of the torquier 2.0 TDI diesel models of course, but the next time you see an entry-level 2.0-litre petrol-powered variant, mark the owner out: they've made a savvy choice.